The Montana Center for Horsemanship (MCH) is home to the nation's only four-year Bachelor of Science degree in Natural Horsemanship, awarded upon successful graduation from this program at the University of Montana Western. Two full-time horsemanship instructors and three full-time UMW professors represent the faculty, which uses an innovative experiential approach to working with horses, turning a student’s passion for horses into a rewarding and successful career. Equine Studies majors also have the unique benefit of working with horses on a daily basis at MCH, located just minutes from campus but in a very ‘real-world’ setting. Academic aspects of the program are designed to increase students’ knowledge of the science, care, and management of horses, as well as to expand students’ awareness of the equine industry well above that of the average horseperson. The University of Montana Western is a public institution founded in 1893. The 20-acre campus is located in Dillon, a rural southwestern Montana town known as the “Horse Capital of the Northwest.” The average class size is 15 students with a total enrollment of 1,470 students. U.S. News & World Report rankings placed Montana Western among the best in the nation and second among "colleges that offer small classes on a budget." All of this amid some of the most inspiring mountain scenery and recreation the West has to offer. Since its inception in 2011, the program has enjoyed incredible success, with 99 graduates from 30 states and three foreign countries, an 80% retention rate and the major with the some of the highest GPAs on campus. 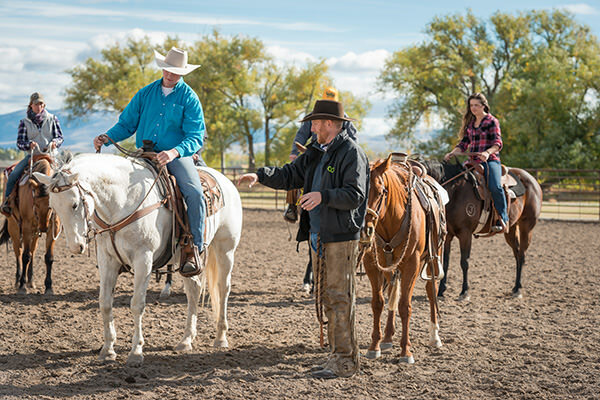 The Program is now in wide demand by students from across America; currently, there are 106 Natural Horsemanship students enrolled in the three degree programs. Program students typically experience significant success post-graduation as well: 80% are employed directly or indirectly in the horse world after graduation, or have matriculated to graduate school.